Question 1:- What is PCOS?? Answer- PCOS is one of the leading causes of infertility & skin issues in young women. Its basic cause is hormonal imbalance. Nearly 5/10 i.e. nearly 50% OF YOUNG WOMEN walking into a dermatological setting are suffering from PCOS. Question 2:- What are the skin problems that you can face due to PCOS?? Question 3:- How to ace those frustrating acnes? 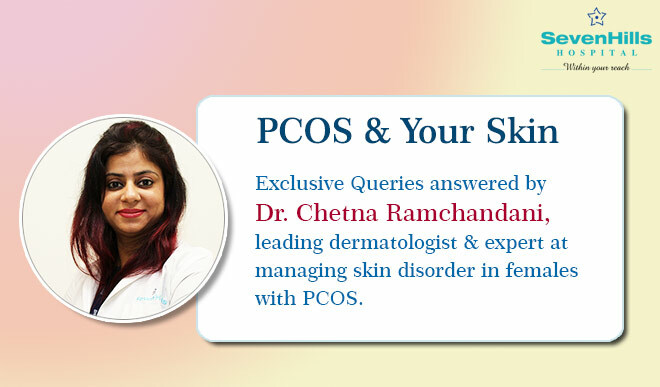 Answer- The acne in PCOS is much more severe and leave scars & marks on the face. Timely intervention is a must to avoid life-long implications. Treatment includes administering hormonal pills, skin peels, lasers to revert to normal appearance. Question 4:- How to excessive hair related problems in PCOS?? Answer- In females with PCOS, unwanted hair growth in a male-beard fashion is seen which becomes aesthetically very unappealing. Measures like waxing, threading, plucking are not only cumbersome but over long periods is also very unappealing. Hence laser hair removal is the ideal solution for all these excessive hair problems. Question 5:- How to get manage hair issues because of PCOS?? Answer- Hair loss is the third most important issue for women with PCOS. Hair loss is generally from the forehead or in the crown area. Its utmost important to seek treatment at correct time as in younger females with age on side, this hair loss can be reverted to the maximum. Treatments like PRP, Mesotherapy, local application and nutritional supplements. Conclusion:- Yes PCOS has many complications, but with proper medication, diet, lifestyle modifications and cosmetic treatments can make you feel confident AND beautiful.